This funny valentine features springing hearts and sparkling stickers to make an unusual holiday greeting. Your Funny Valentine's Day card will be filled with bouncy hearts that spring love! Decorate beautiful layered collage hearts that bounce while on twisty, zigzagged, shiny pipe cleaners that spring love from a zigzag folded card. This multidimensional funny valentine card is full of pizzazz and glitter. Make a funny valentine with your little comedian. Create the card by folding the thick white paper in half, lengthwise. Cut it down the center. 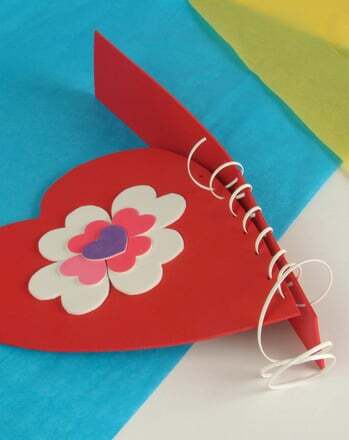 Take one half and fold it into four even rectangles that zigzag like an accordion.This will be the base of the card, where your child will write a Valentine message! 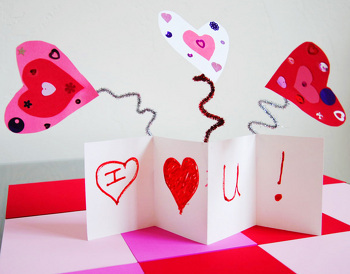 Next, take the colored paper, and draw and cut out three giant hearts, one on each color of construction paper. Each heart should be at least the size of the palm of your child’s hand. Draw and cut out three smaller hearts that fit into the center of the large hearts. Glue the small hearts onto the center of the large hearts. Glue sequins and press stickers onto each heart, covering the small and big hearts. Carefully fold the metallic pipe cleaners into zigzag shapes by bending them gently. 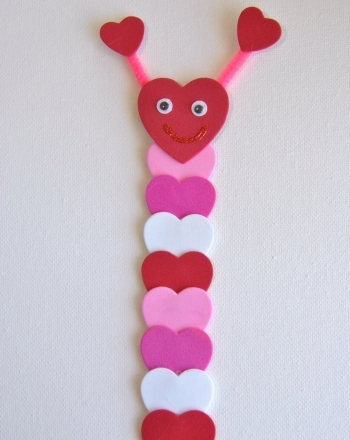 Take one zigzag pipe cleaner and glue one end to the center of the back of one of the large hearts. Secure it with clear tape. Repeat this for all three hearts. Next, take the folded white paper (your zigzag accordion card) and have your child draw their message using red marker. Then turn the card over, faced down onto the table. Measure down about two inches and glue the metallic zigzag pipe cleaner on the fold of the card. Use clear tape to reinforce the pipe cleaner. Repeat this for all three zigzag pipe cleaners. They will each be attached to a fold line on the card. When you're finished, have your child stand up the card and watch the hearts bounce around! Put it on display for a cute Valentine decoration, or send it to a friend or loved one. Righteous writers, get some goofy grammar practice with this worksheet all about funny adjectives.